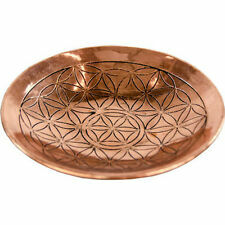 Celtic Flower of Life Copper Ritual Altar Plate, Bowl! Adjustable Copper Magnetic Bracelet with Chakra Colors Gemstones! Green Tree's White Magic 15gram Incense Sticks! 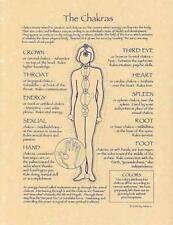 8.5"x11" Chakras Parchment Page for Book of Shadows, Altar! TURTLE Prayer Parchment Page for Book of Shadows, Altar! The Dark Grimoire Tarot Card Deck! Cancer (Zodiac) Parchment Page for Book of Shadows, Altar! Espiritu's Dragon's Blood Ink for Spells, Rituals, Book of Shadows! 1 Bundle of Patchouli Root for Charms, Spells, Rituals! Witches' Alphabet Theban Script Parchment Page for Book of Shadows, Altar! Smudging Set: Smudging Parchment, Fanning Besom, and 2" California Sage Wand! Wooden 7 Chakra Altar Chest Cupboard with 7 Shelves! Rustic 2-Drawer Pentagram Altar Chest! CHAKRA ENERGY CENTERS Laminated Wallet Card! 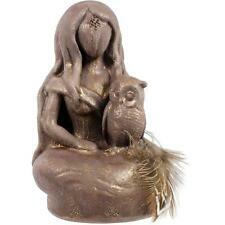 Copper Cow Bell For Altar, Rituals! Tree Hugging Dirt Worshipper Bumper Sticker! Bee Prayer Parchment Page for Book of Shadows, Altar! 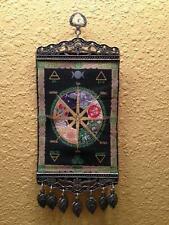 HOUSE HOME BLESSING Parchment Page for Book of Shadows, Altar! 13" Triquetra Carved Wood Book of Shadows Holder! One 4" Diameter SINGING BOWL CUSHION! Moonstone Runes Kit with Book, Bag, and 25 Futhark Runes! 5x8" White Velveteen Tarot Bag with Silver Lining!